These personalized baby and toddler books makes great gifts to Welcome home baby, Baptism, Christening, 1st Birthday, or just to remind the child how special they are. Our treasured keepsakes books that are the story of your child's birth. Included in the story are the parents and child's names, their hometown, time of birth, weight, length, doctor's name and even the hospital. We also have a book for the older sibling to help them learn to cope with the new arrival. Brightly illustrated by a famous Disney artist, this quality hard-cover personalized baby book becomes a unique way of treasuring your child's birth and makes a fun and adorable, life-long family keepsake. The story records all the special details of your child's birth but is presented using cudly characters like "Topper the Turtle", "Squeeky Squirrel" and "Bouncy Bunny", all of whom will keep this book fun and interesting for your baby, even when they're not a baby anymore. 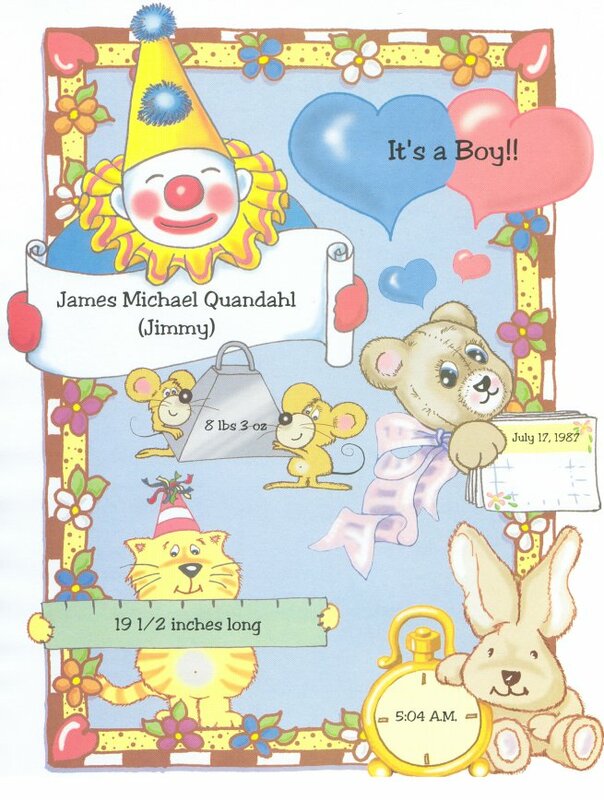 This treasured keepsake book, records the story of your child's birth. We have several different versions to accommodate a variety of situations: Standard, Single Mother's, Christian, Jewish, Adopted and Twins Versions. In the back of this book, there is a place for you to record those important dates to come, from the first smile to the first steps. 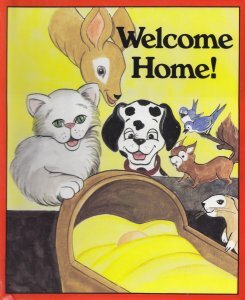 You may remember this book from when you were a child. This treasured keepsake book, records the story of your twins's birth. Most people when ordering a baby book for twins order one for each child. These books are saved and treasured forever. Having their own copy of the book makes the child feel more special and there are no fights over the book when they are older and have to decide who gets to keep it. Each book will contain the same information about the birth of both babies but the dedication page is made individually for each child. This hard-cover personalized baby book becomes a unique way of remembering your baby's birth and makes a keepsake that will be treasured forever. 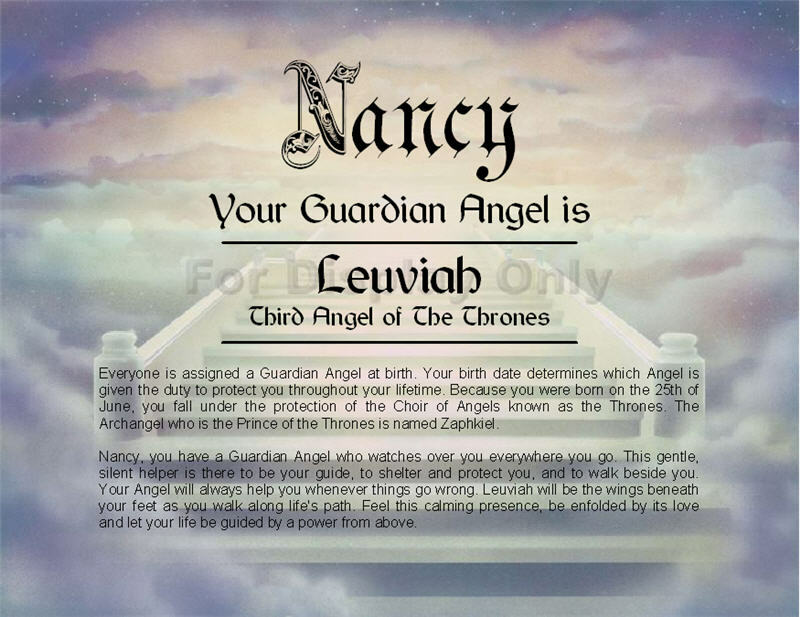 The personalized details of your child's birth is woven into a wonderful story. Giant Size Book: 9" x 12"
A story teaching the older child how to cope with the arrival of a new baby. This book shows the importance of being a big brother or sister. An invaluable way to help ease your child's potty-training stress. He or she will be inspired by personalized encouragement. Your child will want to hear about their potty-training success again and again! 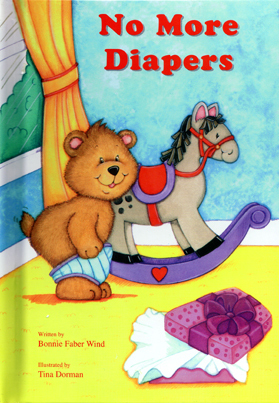 Elmo, Zoe and their Sesame Street friends help your child learn to use the potty in this charming story. No more diapers for Elmo and Zoe! Deluxe Size 6" x 9"
Who's the best artist on Sesame Street? Big Bird helps your child who will be the blue ribbon winner! Counting is fun when you child helps Elmo learn to count to ten in an exciting outdoor adventure. Learning the ABC's has never been more fun. Help Big Bird clean Sesame Street while on an Alphabet scavenger hunt. This whimsical story is perfect for any child who enjoys rhyming and counting. The story uses a fun combination of animals and numbers to help your little one learn how to count. It ends with a special reminder that someone will always love them. This is a very popular book with parents and grandparents. Mother Goose rhymes are even better when they include your name! 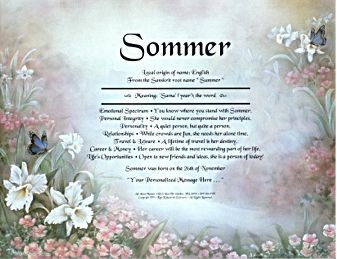 This book has your child's name right in the classic nursery rhymes that we all know and love. It has full page illustrations that are sure to create and bring back memories. Children are shown how they are blessed through special photo insert areas and inspirational verses. Photos are inserted into each page and acetate windows protect the photos. A convenient tote handle fits young hand perfectly. 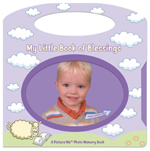 Size: 7" x 7"
Begin showing children the many blessings of our world with this charming Photo Memory book. 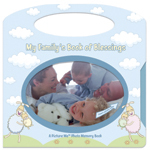 Inspirational verses and special photo insert areas allow families to show the many ways that they are blessed. The convenient tote handle allows book to be carried in a car or to Sunday service. Quality hard board book. Size: 7" x 7"